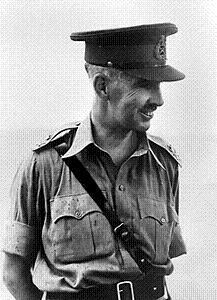 Arthur Percival was General Officer Commanding in Malaya at the outbreak of war. Though decorated for bravery in the First World War, he proved as ineffectual in the Second as one might expect of an officer relegated to the backwaters of the British Empire while Britain was fighting for its life in Europe. Percival seriously underestimated the Japanese, and he implemented an unimaginative defense of Malaya. He got along poorly with Gordon Bennett, the commander of 8 Australian Division, which is unfortunate as Bennett was a reasonably competent division commander and the Australians, though not completely trained, were probably the best troops in the reserve. A nice, good man ... calm, clear-headed and even clever. But he cannot take a large view; it is all a field day at Aldershot to him. He knows the rules so well and follows them so closely and is always waiting for the umpire's whistle to signal ceasefire and hopes that when the moment comes his military dispositions will be such as to receive approval. More sympathetic observers judged that Percival had no lack of "guts" but was more lacking in the dynamism required in a modern military commander.